The Giraffe Room Lounge and Restaurant located at the Inn at Great Neck in Great Neck, New York, has whimsical giraffe sculptures and an impressive, vibrant collection of Art Deco paintings that set the ambience for the intimate restaurant where Chef Naim Bellan focuses on international cuisine. Black wood chairs with burgundy upholstery flank tables set with champagne tablecloths, and dark floral tapestry banquettes with corner niche seating are perfect for cozy tête-à-tête dining. Colored art glass sconces softly illuminate and add visual appeal, as did a glass giraffe set on the back of a corner banquette. Diagonal glass enclosed wine racks act as room dividers, as well as add another level of visual appeal to the wood paneled walls. Edward and I had an excellent dinner at the Giraffe Room Lounge and Restaurant on a raw Sunday night in April when the wind howled and the rain pounded on the glass enclosed atrium section of the restaurant. It was a night that we were glad to be in for the evening and having dinner at the hotel where we were staying. After spending the day exploring the fabled Gold Coast in the rain, we were ready to relax and enjoy an easy evening of dining. Chef Naim Bellan found the way to our hearts by sending us loaves of bread hot from the oven accompanied by individual bowls of sun-dried tomato paste made with sun-dried tomatoes, olive oil, garlic, parsley; a shallow dish of rosemary infused olive oil with roasted garlic cloves which had rich nutty flavor, and bowls of creamy butter, and rosemary to spread on the bread, to enjoy while we perused the menu. Accompanied by glasses of Fetzer Merlot from California, the bread and accompaniments could easily have been a meal in itself. For his main course, Edward had the lump crab stuffed jumbo shrimp, which were gorgeous. 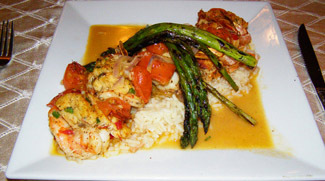 This was a hearty portion of lump crab mixed with minced red peppers, onions, and fresh herbs stuffed into jumbo shrimp, presented on a bed of rice, with a rich pool of roasted cherry tomato wine sauce, and garnished with tender pencil thin grilled asparagus to herald the spring asparagus season. Chef Naim Bellan created a special vegetarian dish for me that was not listed on the menu, a delicious ratatouille, made with roasted tomatoes, onions, eggplant, zucchini, and yellow squash accompanied with a plate of seasoned rice interspersed with minced carrots and garnished with steamed asparagus and minced parsley. Perfectly seasoned and simply cooked, this dish let the vegetables sing their own song. 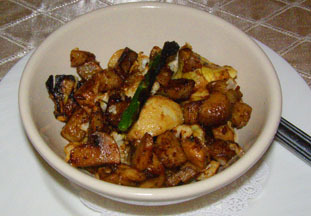 We also had a very tasty side dish of what Chef Naim Bellan called his version of hash, which was a mixture of sautéed diced potatoes, artichoke hearts, mushrooms, cauliflower, and minced garlic. Although the chocolate cake and cheesecake on the menu sounded inviting, we were more than satisfied after overindulging with the warm bread and the generous portions of our main courses. 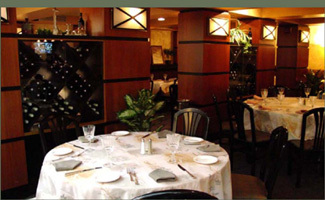 Well-prepared food and attentive personalized service made dining at the Giraffe Room Lounge and Restaurant pleasurable. The Giraffe Room Lounge and Restaurant is open for Breakfast daily from 7:00 am until 10:30 am, Lunch daily from 11:00 am until 2:30 pm, and for Dinner from 5:00 pm until 11:00 pm. 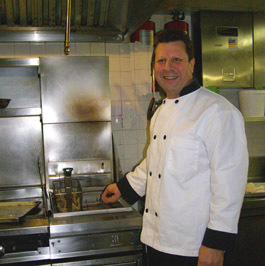 Read about the Inn at Great Neck in the Hotels and Resorts section, and Chefs' Recipes section where Chef Naim Bellan shares his delicious recipes for a taste of the restaurant. Read about the Gold Coast of Long Island in the Destinations sections.